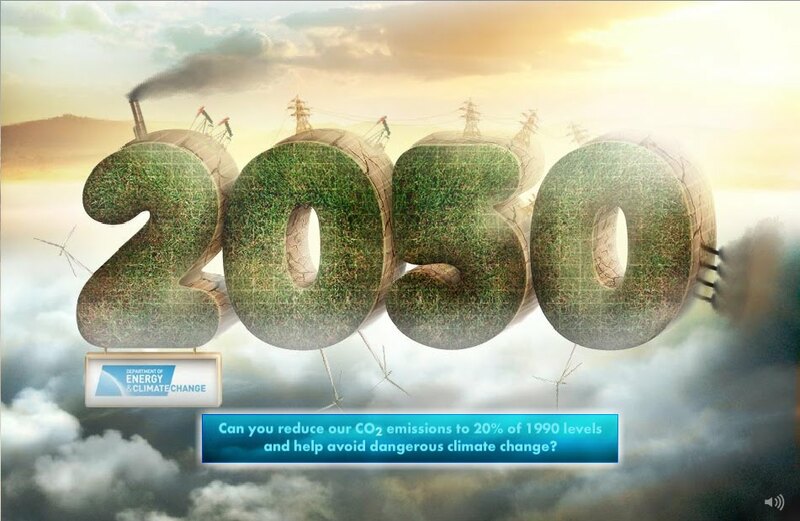 Could you reduce your Carbon Emissions By Over 80% by 2050? The Department Of Energy & Climate Change is keen to engage in an open and transparent choices and trade-offs the UK has to make to reach the 2050 emissions reduction target. By the year 2050 we will need to dramatically change the way in which we use and produce our energy. In order to aviod the most dangerous aspects of climate change scientists propose that the UK should reduce carbon emissions to 20% or less of 1990 levels by the year 2050. My2050 is an online visualisation and simplification of The 2050 Pathways Analysis. The Pathways work presents a framework through which to consider some of the choices and trade-offs we will have to make over the next forty years. It is system-wide, covering all parts of the economy and all greenhouse gases emissions released in the UK. It is rooted in scientific and engineering realities, looking at what is thought to be physically and technically possible in each sector. 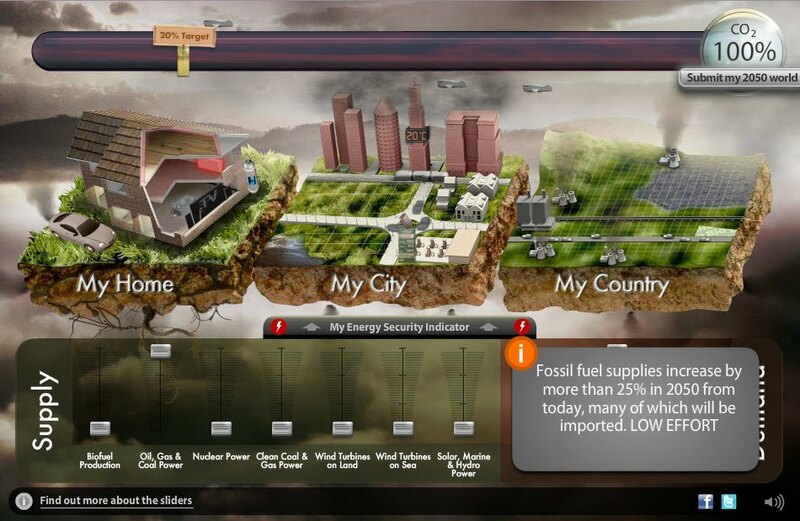 This visual tool uses sliders to control how we supply our energy. You can take control of how our fuel and electricity is generated, reducing the use of conventional gas, coal and oil power stations and/or increasing the use of wind turbines, renewable energy or nuclear energy. 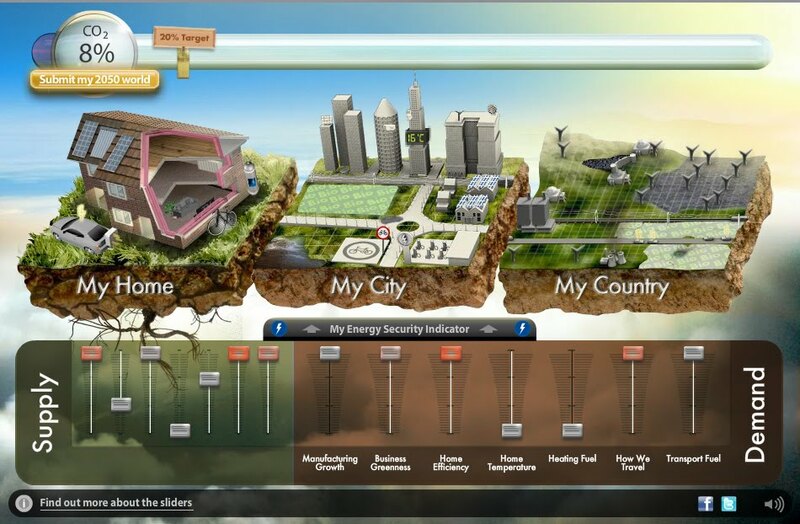 You can also control how we use the energy, increasing business greenness, home efficiency and how we heat our homes. These interactive sliders also have a visual effect on the world above, My House, My City, My Country. e.g. When home efficiency is scaled up the windows become double glazed and the house gains cavity and loft insulation. Or when the use of wind turbines on land and sea are scaled up both My City and My Country show additional wind turbines generating energy. The aim is to reach the 20% emissions target without causing an energy shortage or without wasting large amounts of energy generated. Biomass? Solar Thermal? Conufsed By Industry Jargon? Do you know your biomass from your solar thermal? This year is set to be a key one for microgeneration, so NICEIC has launched its very own jargon buster. The guide provides clear definitions of key terms commonly used in the industry and is a useful tool for those considering installing renewable energy devices on their homes. "More than 100,000 UK homes currently have microgeneration installations," said NICEIC's cheif opeating officer, Emma McCarthy.
" We expect this number to rise rapidly in 2011, and predict it won't be long until private residential homeowners learn about feed-in tariffs and the incentives available.
" To those not in the know, microgeneration can seem a very complicated and confusing world. We hope this will give people a clearer understanding and give them the confidence and courage to engage with microgeneration products and installations"
We at fires fireplaces stoves are proud to bring you the most update to date news and releases related to the industry. We brought you great news of the highly popular Bemodern Led electric fires, and now Bemodern are including the phenomenal electric fire in their electric suites. The new suites are to be known as the Eco suites and they promise to deliver all the quality and style that is associated with Bemodern products. These suites may only be available from contractors or selected trusted retail companies, but are sure to be extremely popular and demand for them will be high as they are easy to install and suitable for most homes with an electricity supply. We will bring you more information on these stunning suites as it becomes available. Some of you may have noticed the electric suite on yesterday's 60 Minute Makeover, if you're wondering what it was so you too could own the stunningly clean and classic lines we have the answer. The Europa Argo electric suite, provided by Fireplace Megastore is made in a beautiful stone effect finish with easy to reach top controls for the 2kW Yorker electric fire. The beautiful clean lines and classical styling mean this unit would fit beautifully in most living spaces and the fully freestanding nature of this unit means no having to make a hole in the wall for fitting. The Yorker electric fire features thermostatic control allowing for easy room temperature maintenance and remote control as standard. The flame effect is able to operate independantly of the heat settings allowing you to create the desired ambience on a summers evening when perhaps additional heat is not required. With the world's current focus on Japan and the crisis at the Fukishima Nuclear Power Plant and possible nuclear meltdown and the disasterous effects this may have on the environment. We at Fires | Fireplaces | Stoves have looked at a Carbon Neutral way of heating your home. Using a woodburning stove. When a tree is burned it releases Carbon Dioxide (CO2) that the tree has absorbed over the life of the tree through photosynthesis. 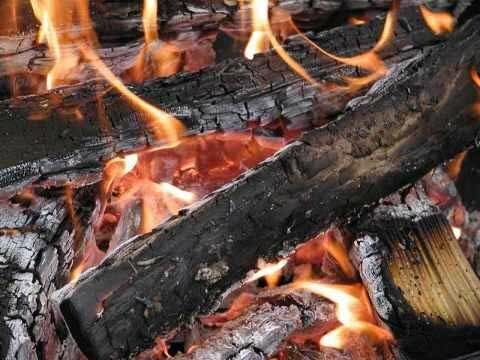 This means that burning wood releases no additional CO2 into the atmosphere and when burning wood from a sustainable source this creates a closed carbon cycle and means that all the heat coming from your wood burning stove is carbon-neutral, not contributing any additional or excessive Carbon Dioxide into the atmosphere. Another advantage of wood, unlike fossil fuels such as gas or oil is that it is an ecologically renewable resource and will not run out. 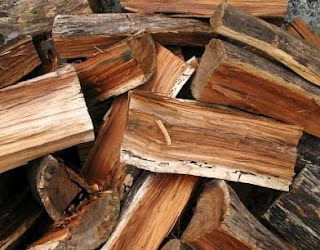 Very soon in the the near future you may be heating your house with sustainable wood or similar biomass technology. 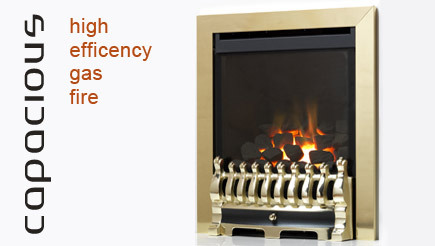 Choose a stove that meets even the most stringent environmental standards. Only burn clean and dry firewood, with ideally less than 20% moisture content. 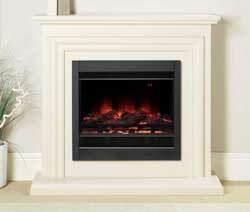 Ensure there is sufficient ventilation for effective combustion. Homeowner Paul Taylor was ordered by Loughborough Magistrates Court to pay over £400 in fines and costs following a fire which gutted his home. Mr Taylor admitted to court that had breached building regulations relating to the installation of a wood burning stove. The court heard that the incorrectly fitted flue was in direct contact with the timber and plastic eaves of the bungalow. Following an investigation by local building control officers, Mr Taylor also admitted that he was not HETAS registered and had not applied to Charnwood Borough Council for a building notice for the work. 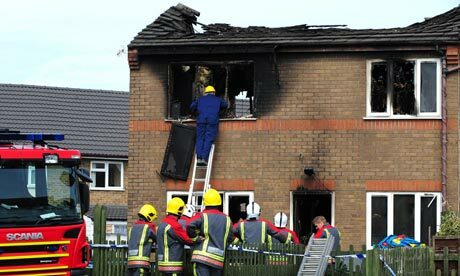 Bruce Allen, CEO of HETAS, said "This case highlights the potential dangers of DIY Installation. Thankfully no-one was injured on this occasion but from a safety point of view we urge customers to use a HETAS registered installer to carry out any kind of wood burning appliance installation"
Householders wishing to install solid fuel or wood-burning appliances must either apply for a building notice from their local authority building control department or must use a registrant of an appropriate competent persons scheme such as HETAS. With Apex's new range of Bio-Ethanol fires now on sale, Fires | Fireplaces | Stoves got to have a glimpse at two of their freestanding Bio-Ethanol Fires. The Apex Affinity and the Apex Duplex. The first fire we got to see was the Apex Duplex, a dual purpose unit, combining a 100% efficient bio-ethanol fire with a stylish coffee table. 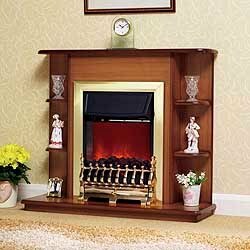 This stunning piece of contempory furniture can instantly become the centrepiece of and modern living space, replacing the traditional and bulky fireplace and surround. At first look the Duplex in it's stunning matt black finish with tempered glass fire guards is the definition of contemporary furnishing and when the fire is lit, giving up to 3kW of heat this fire instantly becomes the focal point of the room and bathing the room in that lovely warm glow. 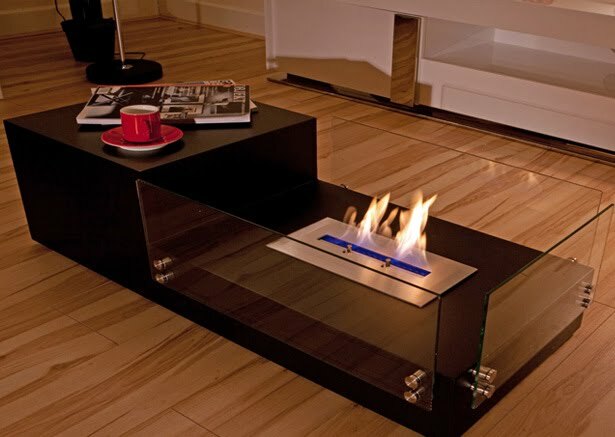 The fire is easy to use, simply fill the reservior and light using a taper, the 1 litre capacity gives up to 5.5 hours of burn time and one of the main advantages of bio-ethanol is that they do not require any flue, installation or ventilation so can be placed almost anywhere in the house! 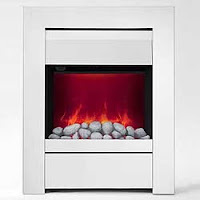 The other fire we got to have a look at was the Apex Affinity, this freestanding white fire comes complete in a white gloss finish that can contrast beautifully with a dark carpet or darkwood floor, also offering a heat output of upto 3kW these fires offer greater heat output that that of an electric fire without the sound of a noisy fan and at greater levels or reliability. 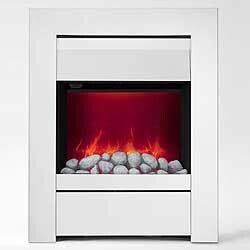 The sleek modern finish to the Affinity is capped with 2 sheets of tempered glass to protect any children or pets from the hot flames in the centre. The twin levels of the surround help this unit stand out from the very symmetrical world of traditional fireplace surrounds. Both these fires, The Duplex and the Affinity have the flexibility to be situated either against a wall or in the centre of the room, allowing you to surround the fire as a centrepiece or to situate it against a wall much like a conventional fireplace. 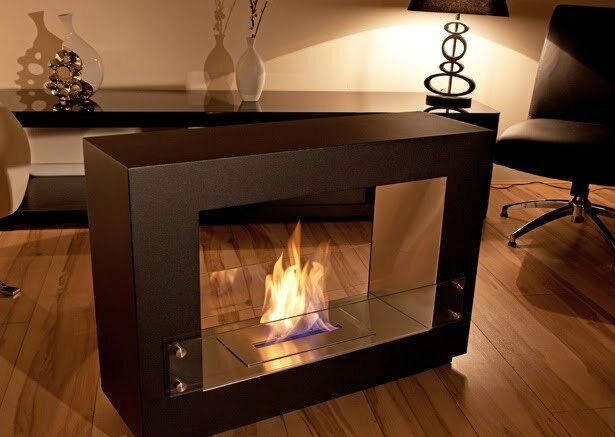 They also boast the flexibility of just having the natural, uninhibited flames dancing in the fire or the fire can be purchased with an additional pebble fuel effect to add that extra little element to these stunning bio-ethanol fires. 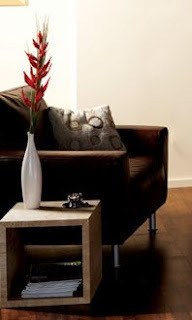 Create A Modern Contemporary Finish In Your Living Room! With the modern interior design trending towards creating a modern and contemporary finish. This article can show just how you can completely transform a traditional living room into a stunningly contemporary living space, but without having to sacrifice the warm ambience that the room already has. 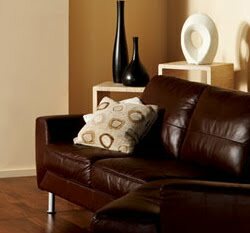 The first thing to establish is a colour scheme, a naturally warm scheme would range from an auburn almost red brown finish up to a natural vanilla finish. These warm colours would lend themselves perfectly to a warm living space. To create this stunning warm finish, I've started with a warm dark wood flooring such as walnut, the rich deep colour adds warmth to the room that beech, pine or another light wood would normally remove. This is contrasted with beech furniture, drawing attention to the coffee tables that would blend in if finished in a matching colour, this adds something to draw the eye around the room, meaning guests or visitors will see every detail, The beech coffee table in this picture compliments the dark wood flooring while drawing attention to the vase and flower situted on it. Complimenting the dark wood flooring and contrasting tables is the choice of seating. This stunning set of chocolate leather seats matches well with the flooring, while not blending in due to the the steel legs. The crowning glory of this room though is the fire. The Apex Rivas 100. 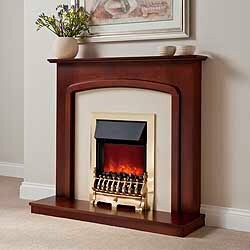 This stunning fireplace is available in a choice of three different rear trims and five different front frames to buy it to suit the living space. Shown below is the bronze rear frame with the brushed steel front trim. This beautifully contemporary fire is beautifully displayed on the chimney breast, creating a focal point that not only fits with the decorum but also heats the room, generating up to 5.5kW of heat while also being energy efficient at up to 80%. The Rivas 100 comes as standard with either the log effect shown below or pebble fuel effect for an even more contemporary finish when combined with the cream fireback (black shown below) as well as the luxury of remote control as standard, allowing control of the fire from the comfort of your own chair. Or for those looking for the "letterbox" look rather than the strong square finish of the Rivas 100, the Rivas 60 is available, this combines all the features and style of the Rivas 100 with a letterbox style trim and window, ideal for smalled rooms when perhaps the Rivas 100 may dominate. 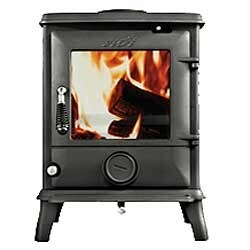 The popularity of wood burning stoves is very high, many wood burning stoves are suitable for use in smoke controlled areas, and they are generally environmentally friendly as they use a renewable energy source, and they have an old fashioned homely quality that appeals to many home owners. However could we be inadvertently damaging our health when using them? Well quite possibly, as the Chemical Research in Toxicology medical journal has recently published research that shows that breathing in particulate matter from a wood burning stove has a similar effect to breathing car emissions. What is this particulate matter found in wood burning smoke? And will it effect me? Well Professor Steffen Loft of the Department of Public Health at Copenhagen University believes that the tiny airborne specs of "particulate matter" found in smoke when burning wood is "small enough to be inhaled into the deepest part of the lungs", and that "the particles that come from wood smoke can certainly cause fatal heart or lung disease". Professor Loft also claims that links can be made to asthma, bronchitis, cancer and other health problems too. It all sounded very damming for the burning of wood and the use of wood burning stoves, however, Prof. Loft did continue on to say that the owner of a wood burning stove should use dry wood, cut into small pieces, and should ensure a good flow of air to the fire to minimise emissions. A German study into wood burning stoves also reached similar conclusions in December in 2010, thus bringing concerns wood burning stoves. So should we all forget the concept of wood burning stoves all together, well, not quite. The Solar Fuel Association commented on the studies saying that there is very little chance of fumes escaping into a property from a correctly fitted stove. This is probably the most important point, that the fumes from a wood burning stove could be possibly fatal, but we don't intend on inhaling the fumes. Any stove should be installed by a registered fitter, who will ensure the stove is flued properly. All stoves available to buy should have met standards that ensure smoke doesn't easily escape into a property, many even incorporate additional safety features such as oxygen depletion sensors etc to ensure the users safety and health. Studies like this sometimes highlight the obvious as many people may assume that all smoke is harmful, but they show us how harmful, and allows us as consumers to make informed decisions as to what fire we use, and what effect using it may have. 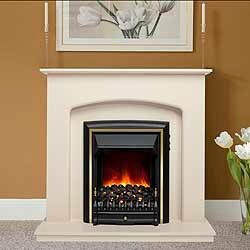 By far the most important point raised by the study and reactions to the study is that no matter what stove is being installed, you should have a registered installer do the work, or check the work done, and pass the installation and stove for use. A registered installer will be able to answer questions and provide up to date information on whether a stove is suitable for your home, and will check to ensure the stove works properly in your home once installed. If you have any concerns about your stove, or wish to get in touch with a registered fitter then visit the HETAS website or give them a call, they are the official body recognised by the UK Government to approve stoves and stove installers. They have an easy to use site, with consumer advice that is informative and easy to understand, and is used by consumers, installers and manufacturers, (even bloggers!) alike. We've just recieved word the Apex is planning to launch a new of Biofuel fires, they offer an all year round solution to enjoying the natural warmth and glow of a real flame anywhere. Burning an eco friendly ethanol based clean burning gel or bio ethanol fuel they can be used in both summer and winter time. 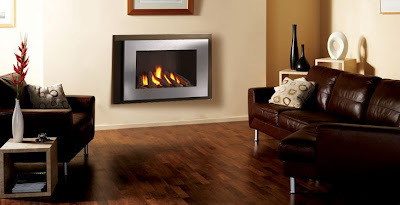 They offer the perfect solution for a disused fireplace or modern house as no chimney or flue is required - place a portable gel fire in your exsisting aperture for an instant glow. Or if you have a blank wall or room select one of our wall mounted or free standing bio fires to light up any space instantly. On warmer summer evenings our portable fire bowls can be simply taken out into the garden as an environmentally friendly burner. With the advantage of being able to be used anywhere the Apex Range Of Bio Fuel fires offer the perfect solution to heating indoors or outdoors without the need for costly installation. 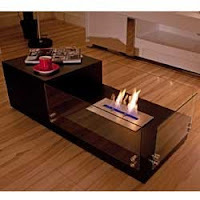 Running on a clean burning bio ethanol fuel eco friendly fires offer the perfect solution for creating instant heat in any situation. Producing real flames these instant bio fuel fires provide a convenient alternative for today’s busy lifestyles. Simply pour into the fuel and light for an instant glow. With only one moving part there is no need for costly servicing making the products almost completely maintenance free. 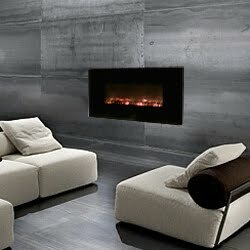 The real flames will provide a focal point for both summer and winter evenings, both indoors and out. All of the Apex bio-fuel fires are eco-friendly as they are derived from the fermentation of crops therefore producing only carbon dioxide and water vapour when burning. With no smoke or fumes there is no need to connect to a chimney or flue.These bio-fuel fires instantly transform any space indoors or out with a comprehensive choice of ranges and styles we are sure to offer the perfect solution for any modern living space. Kendrick Homes is a builder of Luxury Houses based in Walsall, West Midlands. The company prides itself on its craftmanship and skill in creating both individual and desirable properties throughout the UK. 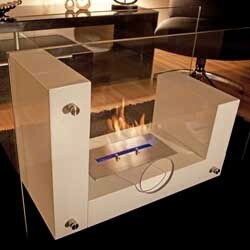 DRU Fires is a leading European manufactuer of contemporary and traditional gas, electric and wood burning fires. Established in 1754, it is a pioneer of fireplace technology, having invented the balanced flue system in the 1930's. Kendrick Homes have selected DRU gas fires for "The Ridings", its latest development of nine individually deesigned executive properties in the much sought-after commuter village of Balsall Common, close to Birmingham and Coventry. DRU Metro 100XT frameless gas fires are situtated in six of the properties with the other three having DRU Global 70XT models. 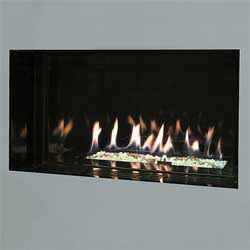 Verine are not content with the amazing success they have already received from their amazing decorative hole in the wall fire, and with a tremendous amount of requests, they have now bought out the Atina fire as a glass fronted high efficiency fire. 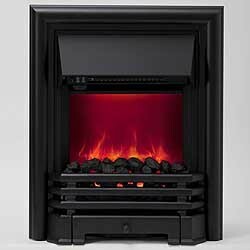 The Verine Atina High Efficiency (HE) Fire is glass fronted, like most HE fires, and boasts an impressive 77% efficiency rating, that is incredible for this size and type of fire. 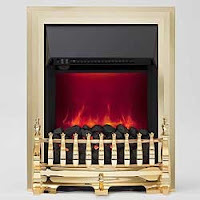 The HE version boasts all of the stunning looks and has equally as much design appeal as its predecessors, however it has a glass front and generates a maximum heat output of 3.5kW where as previous models could not accurately give an output measurement, thus were decorative only, but the new high efficiency model is a massive improvement. 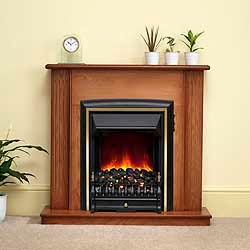 The Verine high efficiency Atina has the choice of either a traditional log fuel effect or contemporary styled white stone effect and comes with such safety features a flame supervision device, which cuts the gas supply should it become unstable, or unlit, and an oxygen depletion sensor that constantly monitors the oxygen level within the room, and should they fall to a dangerous level, stops the flow of gas, switching off the fire. This stunning stylish fire is available in a mains natural gas version or a liquid propane gas version and can be set within a traditional chimney or class two prefabricated flue. The Atina was originally designed to be a frame less contemporary hole in the wall gas fire and have since produced fine frames for the Atina. The Atina HE has the option to be frame less or to be paired with a champagne or silver effect frame that are also available as a wider option too. 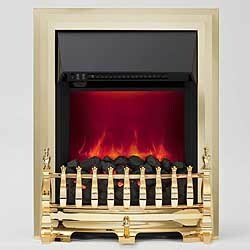 Truly a most impressive gas fire that will captivate viewers of it's beauty making them envious of the home owners style and decadence. Verine Atina High Efficiency fires are only available from reputable suppliers and are sure to be one of the largest selling gas fires in 2011.